A Russian Soyuz spacecraft roared to life and rocketed away from its launching pad in Kazakhstan early Friday, carrying two cosmonauts and a NASA astronaut on a two-day flight to the International Space Station. Soyuz TMA-18 commander Alexander Skvortsov, flight engineer Mikhail Kornienko and Tracy Caldwell Dyson, a shuttle veteran with a doctorate in chemistry, lifted off from the Baikonur Cosmodrome at 12:04 a.m. EDT Friday. During the climb to space through a cloudless blue sky, television views from inside the capsule showed Skvortsov, seated in the center, flanked by Kornienko on his left and Dyson on the right. 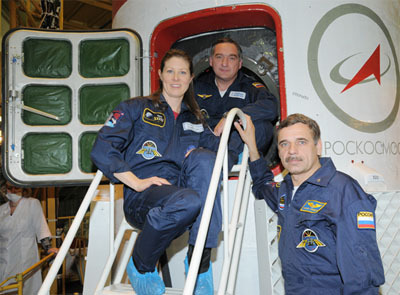 All three crew members appeared relaxed and in good spirits. "Everything is fine, we're feeling fine," someone, presumably Skvortsov, radioed. "Watch that rabbit," a flight controller joked. "It's a ducky!" Skvortsov replied, referring to a bright yellow doll hanging above the commander's head. Hampered by initially poor communications, the crew reassured mission control at one point, radioing "everything is on schedule. We are fine." Nine minutes after liftoff, the Soyuz spacecraft slipped into its preliminary orbit, with a planned high point of 143 miles and a low point of about 118 miles. If all goes well, the trio will dock with the space station's upper Poisk module around 1:26 a.m. Sunday. Waiting to welcome them to the Expedition 23 crew will be commander Oleg Kotov, NASA astronaut Timothy Creamer and Japanese astronaut Soichi Noguchi. The Soyuz launch came just a few hours before the 3 a.m. Friday start of the shuttle Discovery's countdown to blastoff Monday from the Kennedy Space Center. Assuming an on-time liftoff at 6:21 a.m., Discovery will dock with the space station's forward port around 3:44 a.m. Wednesday, boosting the combined crew to 13. The goal of the shuttle flight is to deliver some 10 tons of supplies and equipment, including a 1,700-pound ammonia tank for the lab's cooling system, science racks, an experiment sample freezer, a crew sleep station and other gear. Asked about the tight scheduling between the shuttle and Soyuz, Dyson, veteran of a 2007 flight aboard the shuttle Endeavour, said "I think it rocks, I'm really excited." "These are some great friends of mine on the shuttle and I've flown with some of them, I've trained with some of them and I've shared a lot of dinners and good times with these folks," she said at a pre-flight news conference in Baikonur. "And I'm delighted for them and just ecstatic that the timing worked out for us to be in space together. "But what this means on a larger scale is it really brings out the essence of our International Space Station and our program that we could have a shuttle and a Soyuz launching within days of each other and how we can integrate and add to the already complex nature of what we do and the business we're in." Before heading to the launch pad, Dyson took a moment to sing a Garth Brooks song - "The River" - to her husband, earning applause from dignitaries and guests. In an earlier interview, she said she was looking forward to comparing the shuttle and Soyuz launch experiences. "It's going to be cozy," she said of the three-seat Soyuz. "What I'm really looking forward to is the 180-degree difference between riding in a shuttle and living in a shuttle and doing the same in a Soyuz. They're both tremendous vehicles for totally different reasons. "The shuttle's incredibly complex and it mesmerizes me still, just how all those systems work together at the appropriate time to get us through a mission. And likewise, the Soyuz is just incredibly robust. It's simple and where we're redundant, it's robust. I'm also impressed with the ingenuity and the cleverness of the Russian engineering that went into that vehicle. And that vehicle has withstood the test of time. So I have a deep respect for both vehicles." As for sharing the cramped confines of a Soyuz for two days with two cosmonauts, Dyson said "they're great guys, really intelligent guys, they have diverse backgrounds, they are personally really good people to surround yourself with." "This is their first spaceflight, so it's going to be interesting to see the transformation that I know I went through when I got to orbit for the first time," she said. "They're going to have plenty of time to get over that learning curve, operating in zero gravity." "I imagine when we first get there Oleg, T.J., Soichi, they'll be showing me and the guys around, making sure that we are really comfortable with the environment, able to find things, no problem, and start to work as a crew, a six-person crew which here in training we have limited opportunity to do," Dyson said in a NASA interview. "So I imagine first off it'll be get used to your new home, and then it will be let's get ready for the (next) crew that's coming up and all of the details that we're going to need to provide and work with them to help make their mission a success."